Windows 8 looks set to offer users the option to store a copy of their operating system on a USB stick and boot it up on different PCs. 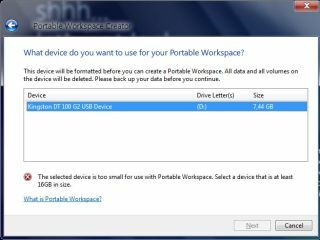 The feature, called 'Portable Workspace' requires a USB stick with at least 16GB to play with in order to store all the necessary files and will please anyone who can't bear to be parted from their OS. It is described as "a feature that allows you to run Windows from a USB storage device" in a leaked screengrab of the set up window. It seems a somewhat unusual move for Microsoft, which has long guarded its software closely, requiring outlandishly long and complex product keys, multiple user licenses and a blood bond to be taken out before you can use any Windows software in order to reduce piracy. We wouldn't be surprised to see all manner of security hidden away in the portable workspace to avoid sneaky unauthorised booting of the OS. Sadly, it looks as though only users with Windows 8 Enterprise Edition will be able to take advantage of the handy feature, suggesting it's intended to make life easier for the IT crowd rather than the humble home user.